YOU CAN’T GET much more idyllic than a wedding ceremony held underneath a willow tree, overlooking a pond, a scenic vineyard, with a charming New England-style barn with wall-to-wall glass doors that provide a wonderful view of the surrounding landscape. Located in Rives Junction (off of U.S. 127, north of Jackson), the 16-acre venue, Black Barn Winery & Event Hall, is owned by husband and wife, Lloyd and Wendy Westers. After they hosted their son’s wedding there in January 2017, they decided to open their property for other weddings and special events. Black Barn was an idea in the making long before it came to life. The Westers have always loved old barns — the couple’s home, which sits on the property, is a reconstructed barn that Lloyd built with his father. They’ve lived there for 30 years, raising their four sons. Ten years ago, the couple started making improvements to the land. 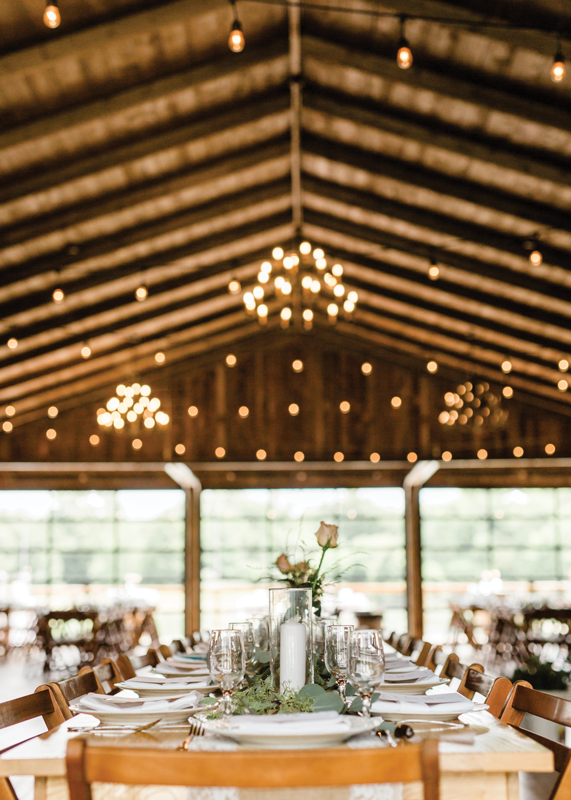 They planted a vineyard — which they’d always dreamed of doing — and in 2016, they used the wood from a 100-year-old barn to build an event space for their son’s reception. The property has indoor and outdoor areas to account for unpredictable weather, and the 3,900-square-foot event space contains a bridal dressing room and groom’s suite. They provide amenities like farmhouse tables and chairs, café lights and chandeliers, linens, a golf cart, and a day-of coordinator. Plus, they’ve partnered with Pineapple Punch Events to assist couples with month-of services. The venue’s serene ambiance is a big perk, too. “We had a ceremony down by the willow tree, and a duck just sat there in the water watching the whole thing. It’s just very picturesque and private,” Wendy says. The Westers have come a long way in just a few years. With every wedding, they’re making more improvements. The winery hasn’t opened yet, but they’re hoping to have it operating within the next few years. It’s a second act that the couple can enjoy in retirement, and they seem to get as much joy from it as the couples that get married there. For more information, go to blackbarnvineyardandwinery.com. Studio 9 Salon is making wedding hair and makeup prep super easy with their mobile salon. They can accommodate entire bridal parties and will come to you equipped with up to four hair and makeup stylists, and, of course, all the tools needed for picture-perfect hair and makeup. For more information, visit studio9salon.com. For more information, visit blusheddesign.com. Elaine B. recently opened a new fine jewelry showroom in Ferndale, and it’s just the place to go if you’re looking for custom engagement rings and bands. If you prefer to buy one of her original designs, you won’t be disappointed. Everything she creates — from rings to earrings, bracelets and necklaces — have unexpected details that make each piece so special. For pricing and more information, visit elainebjewelry.com. With the dry air, sodium-laden food, and high altitude, traveling by plane is not exactly conducive to glowing skin and bright eyes. That’s why we love Aria Travel Kit, especially as a bridesmaid gift. 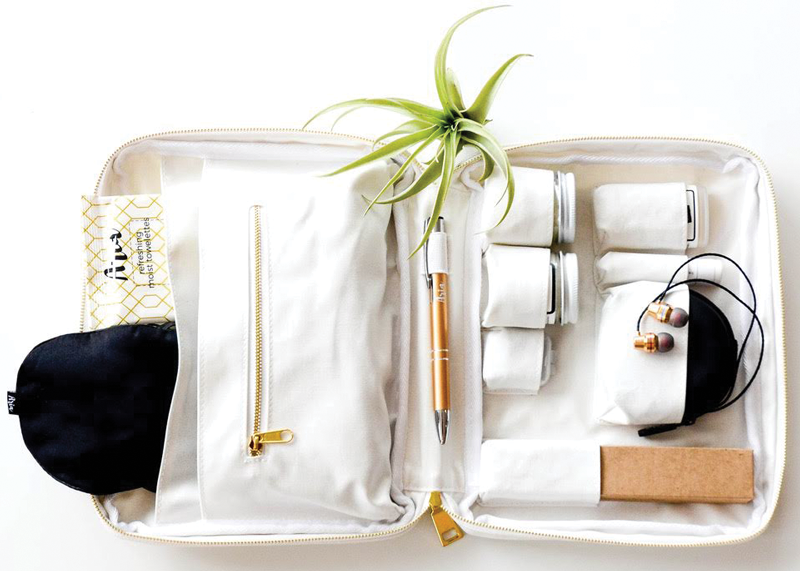 It has practically everything you need to feel fresh faced and ready to go when you step o the plane, from a face and body moisturizer, lip balm, toothpaste, and toothbrush, to deodorant, towelettes, socks, and a silk sleeping eye mask. Plus, all of the products are natural. Your girls will thank you — and even more so if they’re traveling for your nuptials. $79, at ariakit.com. B. Ella Bridal (b-ella-bridal.com) in Plymouth offers designers like Wtoo by Watters, which makes classic gowns with a fresh twist. Think lace sleeves, illusion bodices, and deep V-necks. Their new Julietta collection by Mori Lee focuses on the most important thing, no matter what size you wear: a great fit. Bella Bridal Gallery (bellabridal.com) in West Bloomfield recently debuted a line of plus-size wedding dresses called Everybody Every Bride by Essense of Australia, which includes tried-and-true silhouettes like strapless mermaids, soft A-lines, and modern ballgowns. 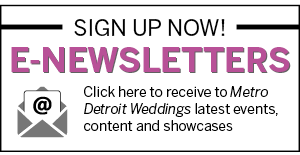 For cool, unique styles, check out Detroit Bridal House (detroitbridalhouse.com). This intimate salon sells lesser-known designers like Daughters of Simone, Stella York, Rebecca Schoneveld, Alexandra Grecco, and Sabina Motasem. And you can’t go wrong with David’s Bridal (davidsbridal.com) — whether you’re looking for something classic, modern, minimalist, or romantic, chances are, they have it. And for a great price, too. You’re probably already using Pinterest to source bridal inspiration and ideas, but a variety of other great apps will also be valuable resources, especially if you’re not using a wedding planner. Here are some of the best. 1. Wedding Happy. This free app has a to-do list to keep you organized and on track. 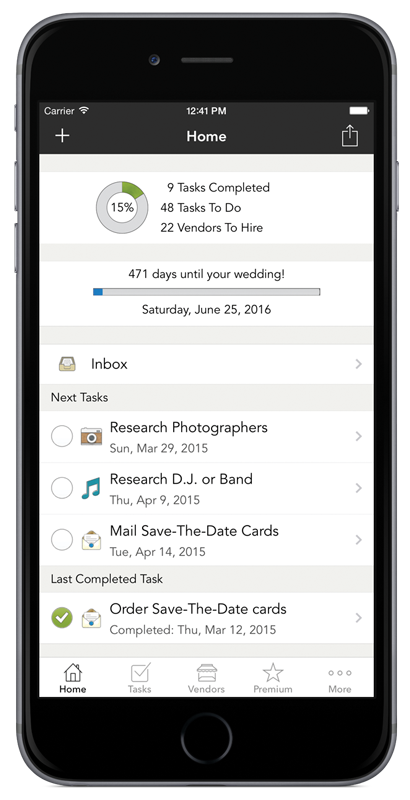 It sends alerts so you know what to focus on next, whether sending out invitations or scheduling your cake tasting. 2. WedPics. Have your guests download WedPics (it’s free), because the app aggregates all of the photos from your wedding in one place, so that everyone can see and comment on them afterward. Even better than a wedding hashtag! 3. Pantone Studio. This is helpful for all things décor and style. Whether you want to identify the perfect shade of blush, or make sure your bridesmaids are all on the same page when it comes to what burgundy looks like, you’ll be happy to have this app. ($4.99). 4. Appy Couple. Make communication with your guests more streamlined than ever with this free app, which lets guests easily RSVP, pick their menu, buy gifts from the registry, and find all of the wedding information in one place. 5. Thumbtack. Thumbtack lets you search for, and hire, all your wedding vendors, from DJs, caterers, and florists to hair and makeup artists. And it’s free!